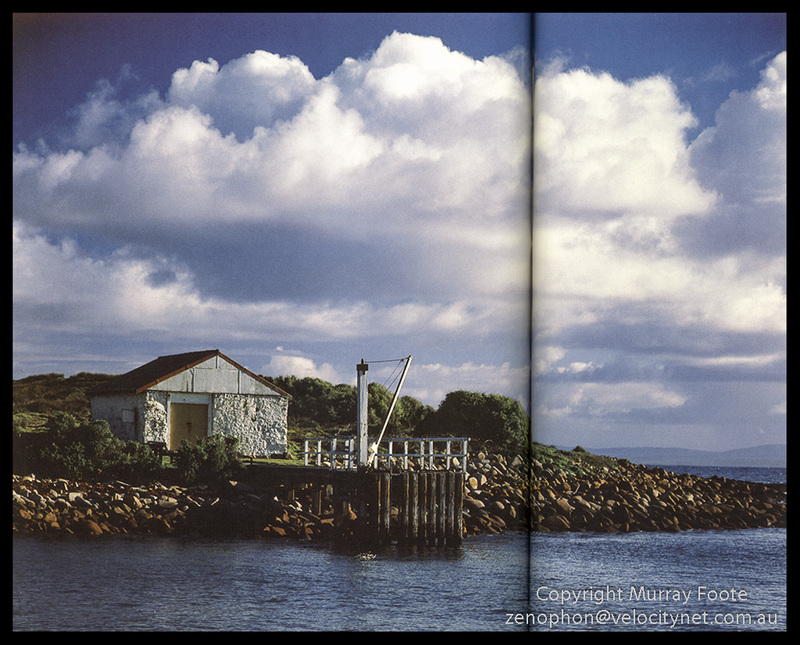 I visited Gabo Island lighthouse on 23 July 1987. I infer from my notes that I was only there for a few hours during the day and did not stay overnight. 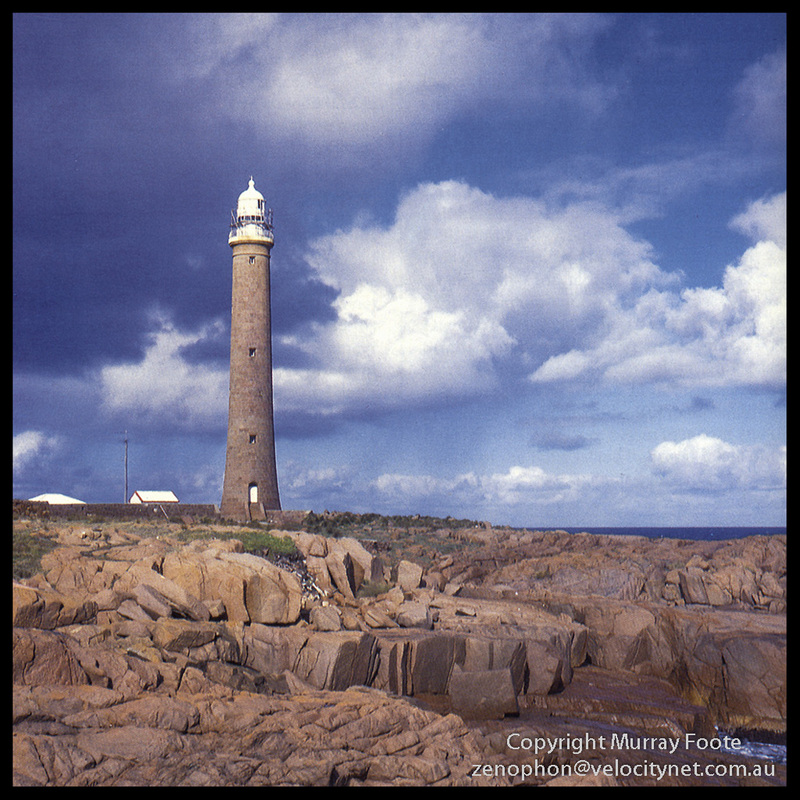 Gabo Island lighthouse was built in 1862 and stood 47 metres high, the third highest in Australia. As you can see from the colour of the rocks and the lighthouse, the source of the stone was nearby. The tower has a subtle curve, indicating the design was based on British lighthouses that were directly exposed to the action of the sea. Usually it would have taken a tsunami for that to apply here, but as we shall see below, there was at least one occasion when that may have come in useful. This is the wharf and the storehouse for the island and I presume is where I arrived at and left the island (it was definitely by sea). These predate even the temporary lighthouse and were built in the 1830s for whaling operations. The first effort to build a lighthouse was in 1846 but failed because they were expecting to find bedrock for foundations at eight feet but encountered it only at sixty-eight feet. Then in 1853 the steamship Monumental City sank near Gabo Island with the loss of thirty-three lives. Consequently, the first lighthouse, a temporary wooden structure, was erected near here in late 1853 and the keepers camped in the whalers’ hut which at that time had no roof. One of the legs of this tower was damaged when brought ashore so the builders adapted the keel of a nearby sunken ship. They were also left only one-third of the promised rations and had to mainly survive for the first three months on shark meat acquired by fishing. The keepers again ran very low on supplies in 1854. This is the only image of the three for which I have a scan of a slide, or in this case, three slides which I digitally combined. My notes indicate that it was starting to rain and I had to complete the exposures in some haste. Large format lenses have open shutters that do not like rain. The old lenses I was using were also uncoated and the middle exposure had considerable flare and fogging. Fortunately I was able to largely recover from this in digital post-processing. After a huge storm in 1884, the high-water mark was recorded above and behind the keepers’ cottages. That there was no loss of life would have been because all families took shelter in the lighthouse. After the same storm at Iron Pot lighthouse, in the harbour outside Hobart, the keepers had to remove kelp from the railing outside the lighthouse lantern room. This entry was posted in Australia, From Dusk Till Dawn and tagged Architecture, Australia, Gabo Island, History, Landscape, Lighthouses, Photography, seascape, Travel, Victoria. Wow, your images are gorgeous. Thank you for visiting my blog; I’m honored you liked a few posts.